Natural gas is formed primarily of methane and can include ethane, propane, butane and pentane as well. Natural gas can be found in oil field, natural gas fields and coal beds. Natural gas storage and transportation is its biggest difficulty because of the low density. Natural gas is often referred to as just gas, without the word natural. Natural gas price is in US $7 per 1000 cubic feet (2007). Natural gas is non-renewable energy source as the all fossil fuels are and is used mostly for generating electricity and heating. Natural gas releases smaller amount of CO2 than oil and coal and is ecologically the most acceptable fossil fuel. Natural gas production by country (click on picture to enlarge). Natural gas is commonly used in homes for cooking, heating and water heating. Natural gas doesn't have odor (since is made of methane) and therefore gas companies add "rotten-egg" smell so people could detect possible leakage. Natural gas was discovered many centuries ago as they are proof of its use in ancient Greece and Persia. Natural gas wells average 6000 feet deep and it costs close to $80 to drill so it's important to choose the drilling sites very carefully. US produces about 22 % of the world's total natural gas production. US imports natural gas mainly from Mexico and Canada. Natural gas usually gets to consumer by pipelines (in US there's more than one million of underground pipelines). US has large reserves of natural gas, especially in the Gulf of Mexico. Natural gas is cleaner fuel than coal and petroleum because it contains less carbon and therefore has cleaner burning and also has smaller amount of sulfur. LNG tanker (click on picture for full size). Natural gas can be converted into the liquid state and then is called Liquid natural has (LNG). 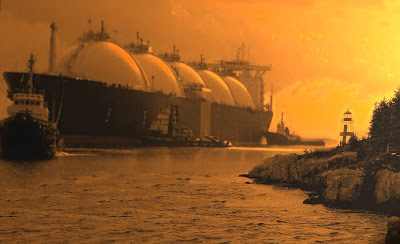 LNG is made when natural gas becomes liquid and for this its volume must be reduced 615 times which can be done by cooling natural gas to temperature of minus 260 F.
LNG is much easier for transportation and storage than the natural gas but tanks for storing it are expensive and this is the main reason why LNG isn't widespread as it's not very commercial. LNG has energy density in the rank of petrol and diesel fuels and does less pollution than these two. LNG needs LNG plant for its production and transportation and LNG plant consists of one or more LNG trains, each of which is an independent unit for gas liquefaction. LNG plant construction costs $1-3 billion. LNG is shipped around the world in specially constructed seagoing vessels. LNG pollute environment more than natural gas because of the energy needed for liquefy it and transport it. LNG tankers could be exposed to terrorist's attacks and therefore fats ships are following these tankers. LNG tanker so far never exploded. LNG safety must be taken to the highest level in order to prevent LNG accidents. The largest LNG train is the SEGAS Plant in Egypt with a capacity of 5 million ton per annum.